Home » Fishing Reports » Backcountry Fishing » Temps Chill – Backcountry Fishing Stays Hot. Key West backcountry fishing stays hot through the winter. End of January report and weather warning. Cobia start to come in to the shallows when it gets cold. A nice tasty surprise for our anglers. January 15th 2019 – Winter Is Here in Key West. Steady temps in the 70s with lows getting into the low 60s and water temps bouncing around between 66 and 70 are all great indications that winter has arrived here in Key West and the cast of characters we generally see in the backcountry are all here. Some inclement weather coming next week but things will get back to nice again after. 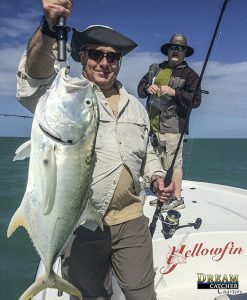 Jacks are the under-sung heroes of our winter fishing Key West. These pit bulls eat well and pull hard. Its been a casting – catching slug fest in the backcountry fishing for our anglers here at Dream Catcher Charters. Just like the last report of plenty larger than normal trout, Larger jack crevalles, lady fish, some redfish, a few pompano, sharks, barracudas and mutton snappers. The last week has been pretty good on the trips that did not have to deal with the super low tides. Today its Key Wests version of blustery. Winds out of the North at 20 and 65 degrees with some overcast skies. We love winter fishing here. I can remember days when we used to do species hunts and in the winter my angler could boat 18 different species in a 6 hour backcountry fishing charter with an 18″ limit to be counted. Thats a great fishery. Dream Catcher Charters Backcountry fishing is a fantastic and the most affordable way to go fishing fish Key West on a private charter. Great for folks who don’t want to roll the dice on the weather fishing offshore and taking a chance on getting seasick. No matter how hard the winds blow, if we go we can manage to find places to fish that our anglers can catch fish, stay in calm waters and not get seasick. We offer the most affordable private charters in Key West fishing the backcountry. Check out our backcountry fishing rates. For the rest of January the weather looks to be steady in the long term forecast as far as temps go.. Some windy weather next week will certainly have its affect on our Key West fishing charters however I think it will make our backcountry fishing even better. Because we are finally getting a good winter I am in hopes we start to see some cobia on the flats tailing up behind rays or sharks for added fun for our anglers.. Everything else should remain the same. I do not see any tarpon fishing in our near future, however the permit fishign might be good on the flats after the water clears up from the blow next week. Its gonna get “Sporty” next week starting the 20th with winds gusting to 30mph from the North as a front approaches. (thats not fun). This windy weather will be from Sunday afternoon through till Thursday. Give us a call. Flats, backcountry, deep sea or reef fishing.. We have it all here and personally will tell you all about it.